What is it about old automobiles that draws our admiration? is it simply a nostalgic longing for the good old days, a sentimental walk down memory lane? or is there actual beauty in their design? I would say that there's something of both at work. 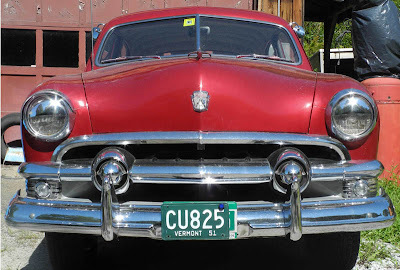 I recently saw this deep red 1951 Ford coupe parked at a garage on a back road; the color, the chrome, the generous curves, made for a striking design. 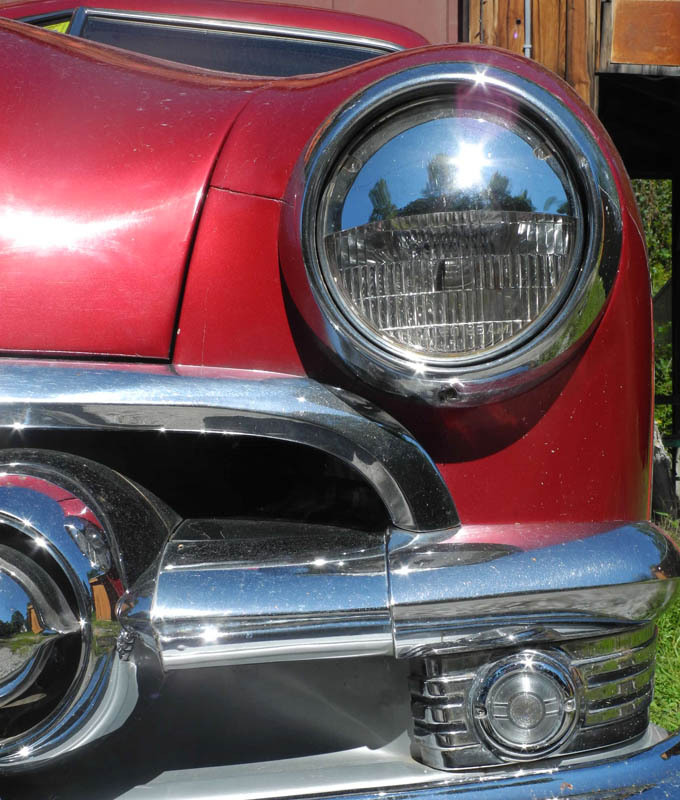 Every detail seemed considered, from the repeated circles of headlights to the exact curve over the headlight, which then dipped down and rose again over the hood. When I look at photos of cars from the 1940s or 1950s cars before the age of fins, I see lots of luscious curves, and can't help but think––especially since men had a habit of calling cars "she", along with ships––that the designers caressed them as they would a woman's body. Then there's all that shiny chrome which seems a symbol of modernity. 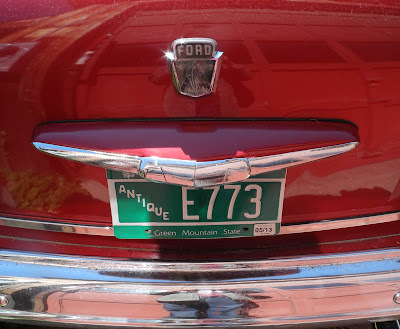 In the days before the Interstate Highway System, which was authorized in 1956, a car must have been a status symbol, an emblem of freedom, and of the open road. There was "See the USA in your Chevrolet". I don't think we have a romance with our cars in quite the same way anymore. 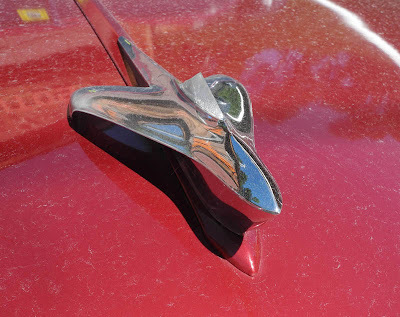 And on the hood, a rocket, a paean to the Jet Age, a time of excitement and new possibilities, and new prosperity after the war. 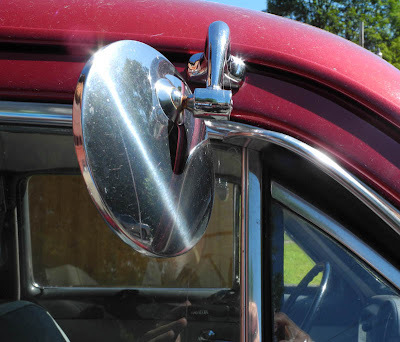 The round shape of the cantilevered rear view mirrors echo the circles of headlights. 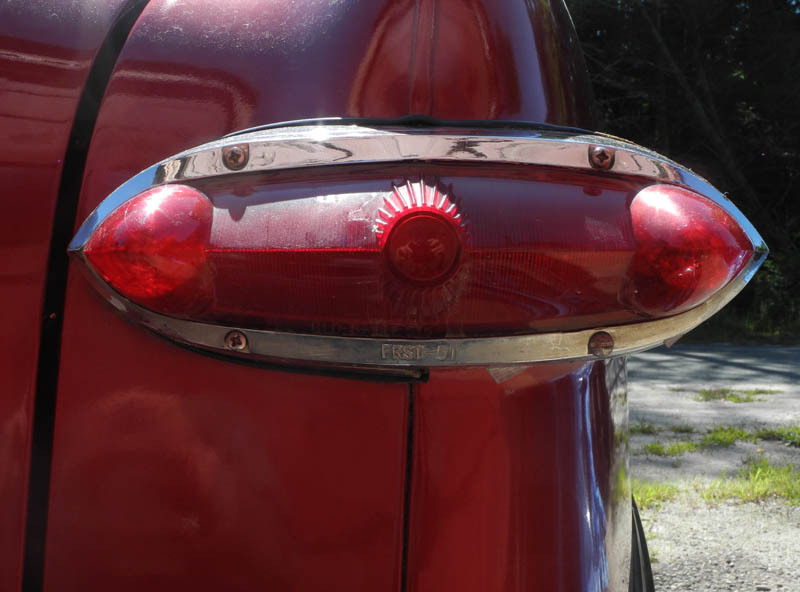 The tail light is inspired wackiness, with its long pointed oval and three protuberances, like a rocket turned on its side. 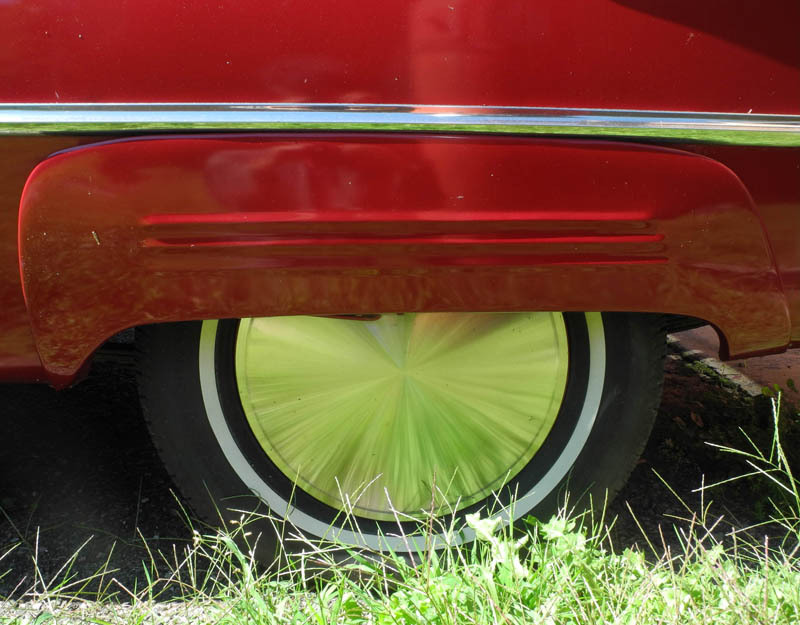 The wheel cover is elegant, and the three ridged lines emphasize forward movement. I loved seeing that amid all the curves in this car, there was one element that had straight sides: the gas cap lid. The door handle and lock also have a jet age look with the zoom of pointed sides. I like the little detail of parallel lines in front of the button, again suggesting speed like the lines on the wheel cover. Here's just a little comparison with a very non-romantic vehicle, my 2006 Subaru Forester. 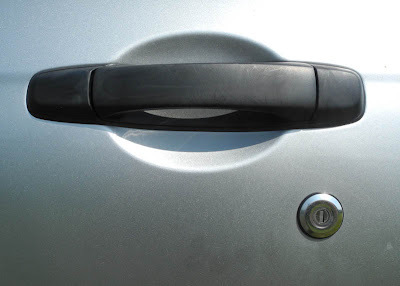 The design is simple and uses easy-care materials, but the round key hole does not work with the oval scoop behind the handle; the lines of the handle do not line up with that scoop. Those are just small design decisions that make the vehicle utilitarian and not artful. 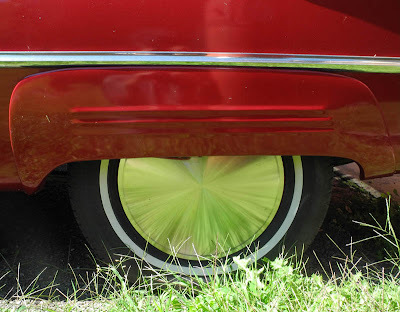 Even the rear of this car has pizzazz, and I can imagine it cruising down a highway that used to be, garnering attention from the smattering of autos on the road. 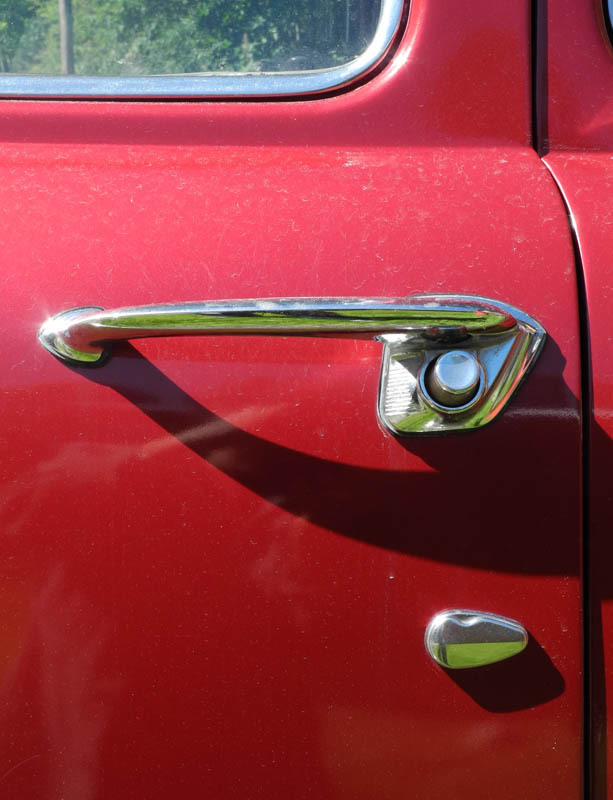 I cannot imagine that in 50 or 60 years anyone will be feeling nostalgic about today's cars, except for a very few exceptions; good design does count. 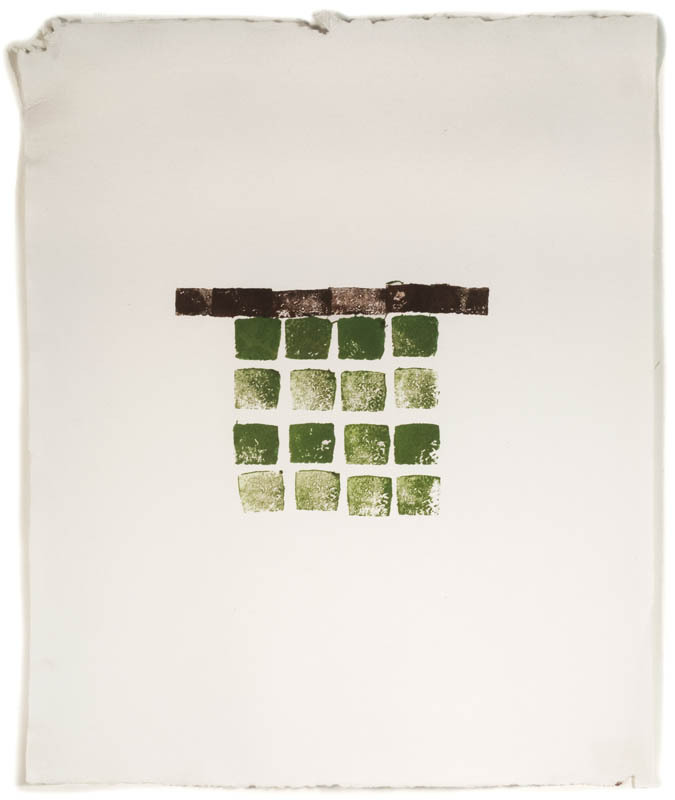 Green Squares, ink on Masa dosa paper, 23 x 18 in. My varied printmaking ventures––with cardboard plate multiples; with digital prints; and with these images made by cutting shapes from potatoes, dipping them in ink, and stamping them on paper––have been giving me a lot of pleasure. I'm able to explore new kinds of imagery and push myself in new directions. This leads to a lot of flopping on my face, but that's okay. It also leads to a lot of uncertainty as to how to assess what I'm doing. 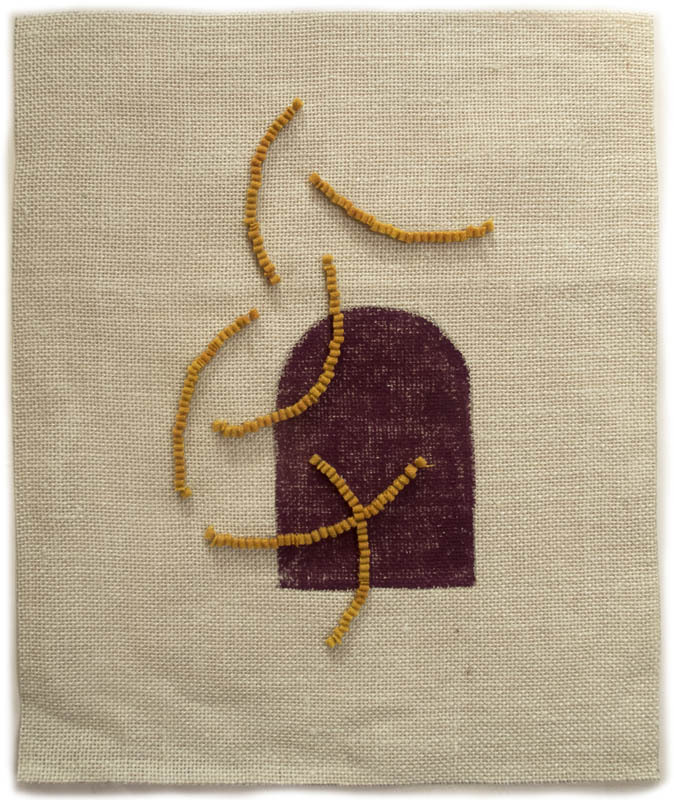 I'm beginning to be more relaxed about throwing work away; since the potato prints are fast and intuitive, there are bound to be a lot of duds. One thing I'm learning is that I like working on a large sheet of paper, such as the one above, so that the image can have lots of breathing room. Four Square, ink on Nishinouchi paper, 12 x 10 in. 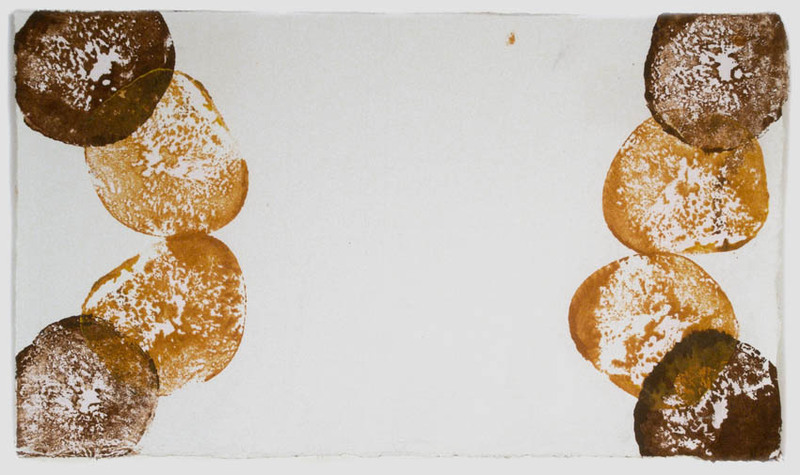 Balancing, ink on Akatosashi paper, 4 3/4 x 13 3/4 in. although I also enjoy the fun and humor of this more complex print. Dropping, ink on Sansui SH8 paper, 19 x 10 in. 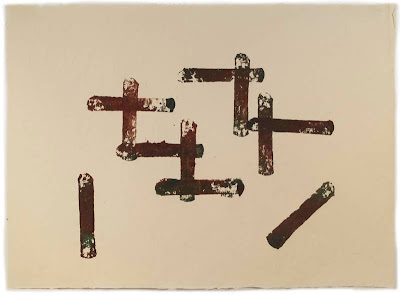 I like using the same shape, stamping it over and over as it runs out of ink. Escape, ink on Masa dosa paper, 8 x 23 in. 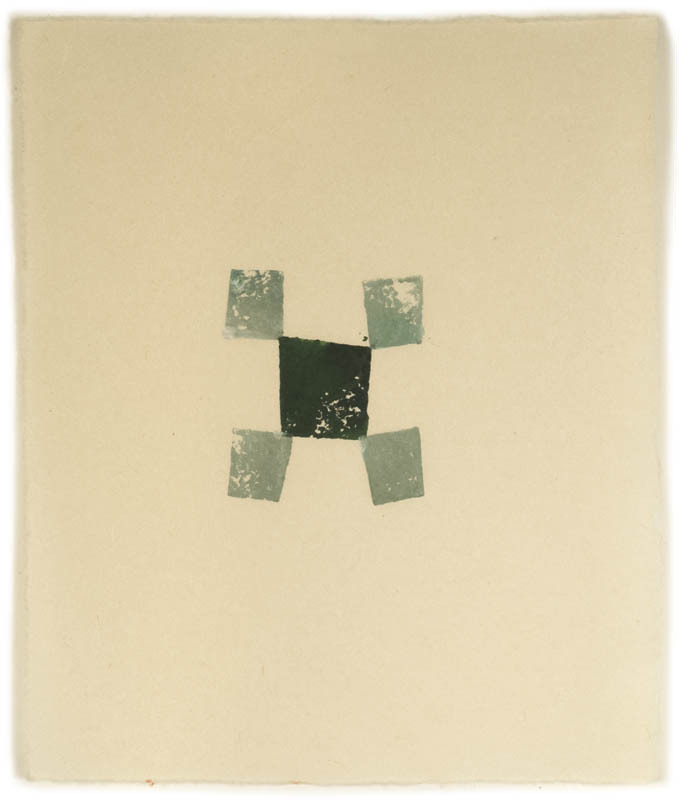 Like in my textiles, geometry has an irregular presence in the prints. Black Boxes, ink on Gifu green tea medium paper, 15 x 13 in. Crisscross, ink on Twinrocker paper, 18 x 23 1/2 in. 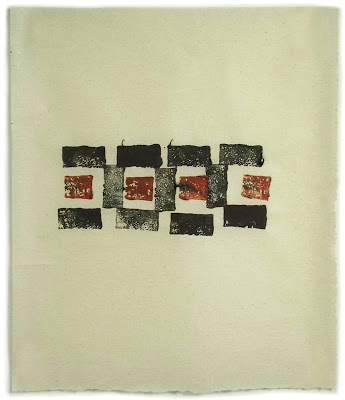 This print is on a beautiful sheet of handmade paper that's been in my drawer for years. (I regret that my photographs don't give a better sense of the paper surfaces.) When I'm working on a large sheet of paper, I have to put my fear of wasting paper aside, and just plunge ahead as though it's a sheet of cheap newsprint. Inward, ink on Masa Dosa paper, 7 x 12 in. Here I'm playing with an empty center and the pull of shapes toward each other. I feel that these prints express different moods, though mostly balanced toward the lighthearted. And although I can feel like I hit a brick wall (my most recent potato print session was mostly trash), working in this medium is still a surprising joy. 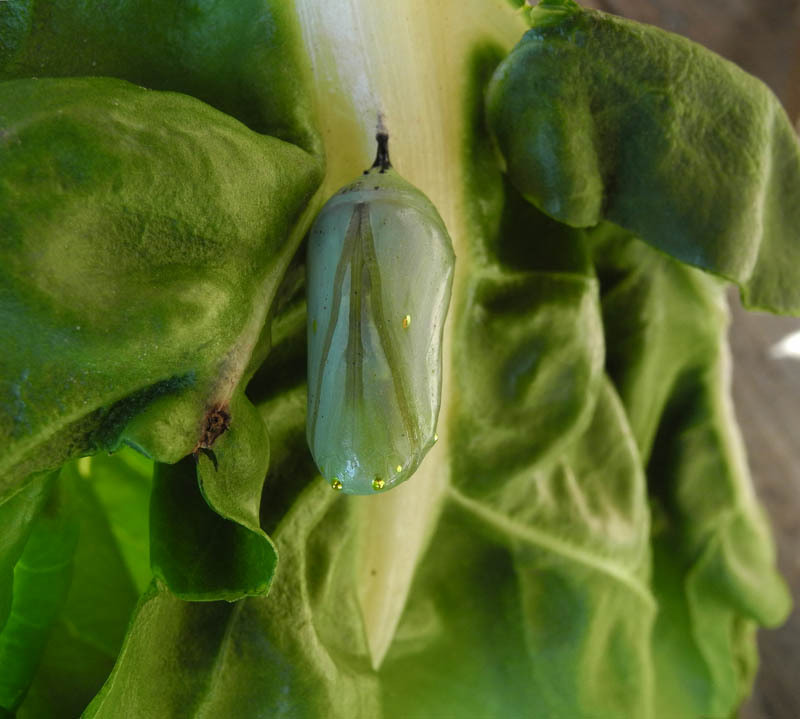 A week ago, on August 18th, while sorting through some swiss chard leaves that I was about to wash in preparation for blanching and freezing, I was surprised by this small, elegant, jade-colored chrysalis attached to a leaf. At first I didn't know what it was, since this is its back and it is usually photographed from its gold-banded front. 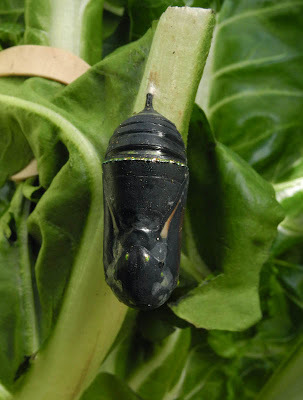 It is the chrysalis of a Monarch butterfly, and I'm very glad I didn't boil it. 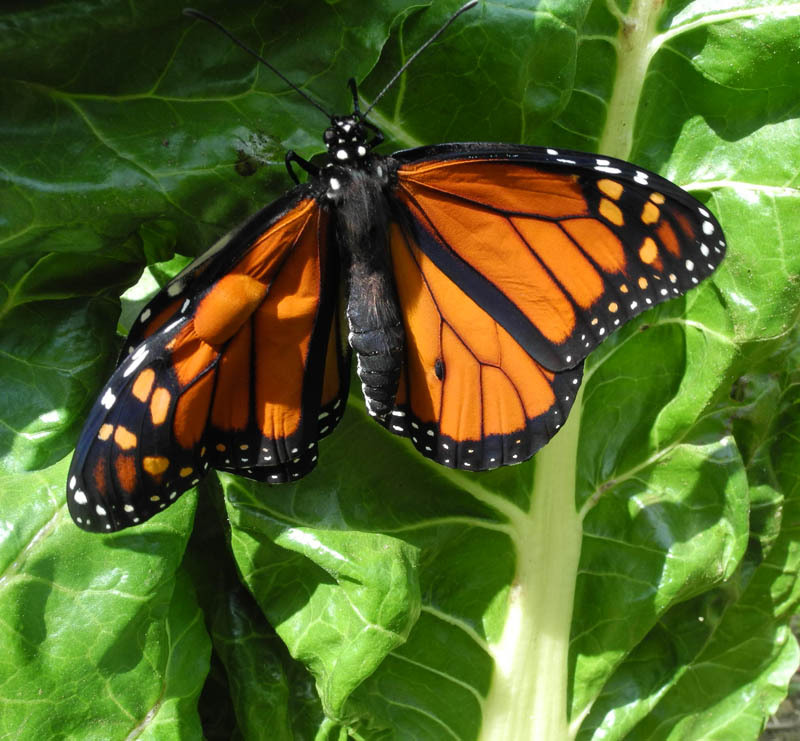 I put it back in the garden, propped up in the swiss chard. Well, yesterday it happened again. 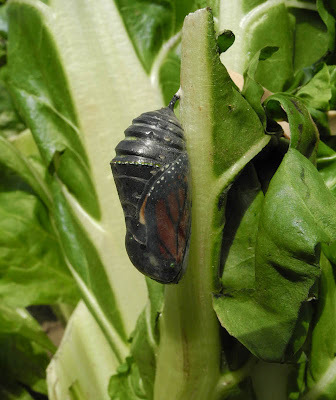 I found another chrysalis on the swiss chard, just in time before it was boiled. It looked a little further along in its growth than the previous one, and I put it back in the garden. I was very surprised this morning, when I went to check the two chysalises, that the one I found yesterday had turned black overnight (the previous one just has dark spots and I think it will not mature). This is an indication that the butterfly will emerge soon. A little later and I could see the Monarch's orange wing showing through as the chrysalis became more transparent. From online research, I thought I had at least a half hour before the butterfly would begin emerge from its small container, so I went in the house to do some chores for 20 minutes. Oh! how sad I was to return at 10:58 (the first photo I took of the butterfly had that time stamp) to see that I had missed the process of unfolding from the chrysalis. But what a beautiful creature, and how amazing that it emerged from that one inch, delicate shell so quickly. An hour later it had tentatively begun to open its wings as they dried and hardened. It moved higher on the leaves until it was close to their top. By 1:30 it was gone, flown off on its adventures. It is a delight to see these bright butterflies flitting here and there, high in the air, and down to sip on flowers. 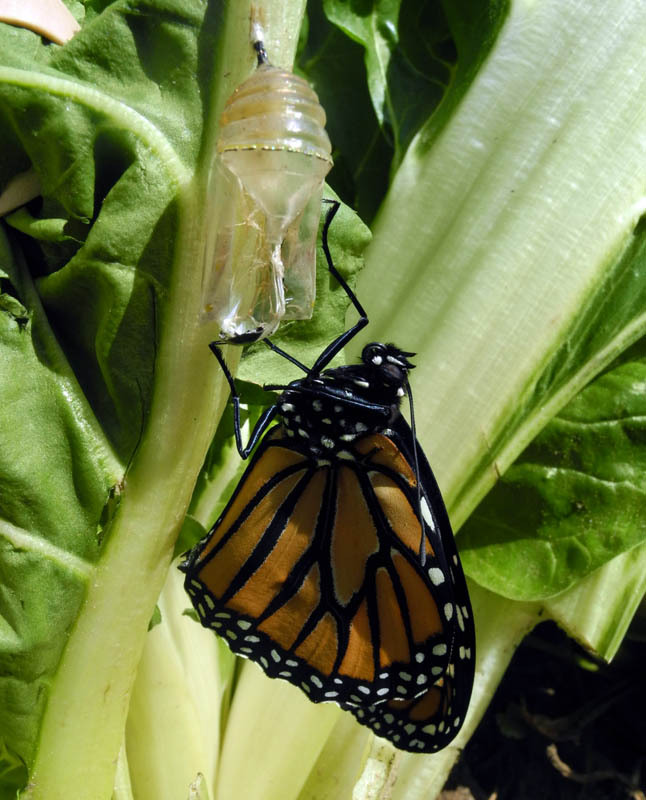 Their transformation from caterpillar to chrysalis to butterfly is a magical one and lends their existence an air of mystery and metaphor. They are freedom; they are possibility. A New Painting: "Blue Bar"
Blue Bar, egg tempera on calfskin parchment, 6 1/2 x 7 1/2 in. 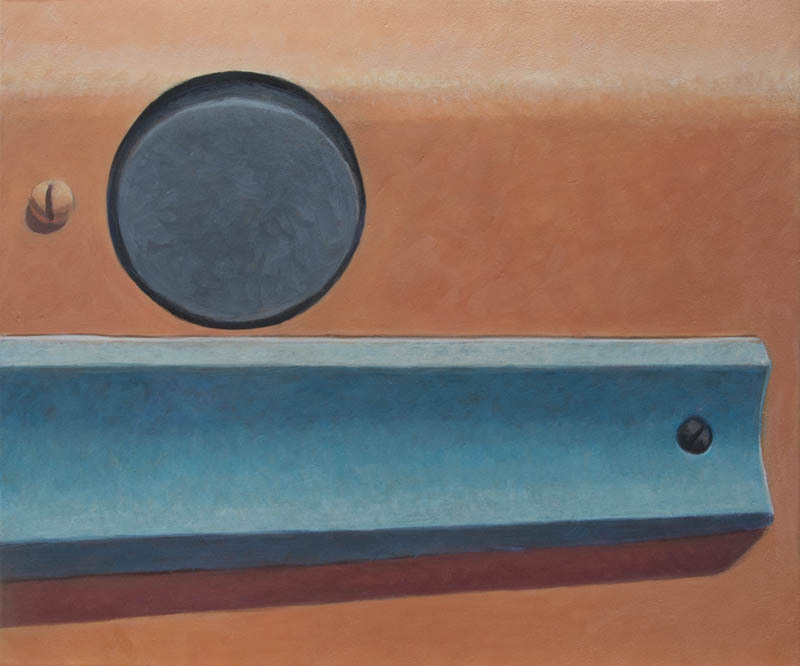 Sometimes a painting just isn't working; it could be because of the color, the light, the form, the composition, or my inability to achieve what I'd envisioned. My choice is either to toss the painting––wipe it off and use the panel for another work––or keep trying to fix it. 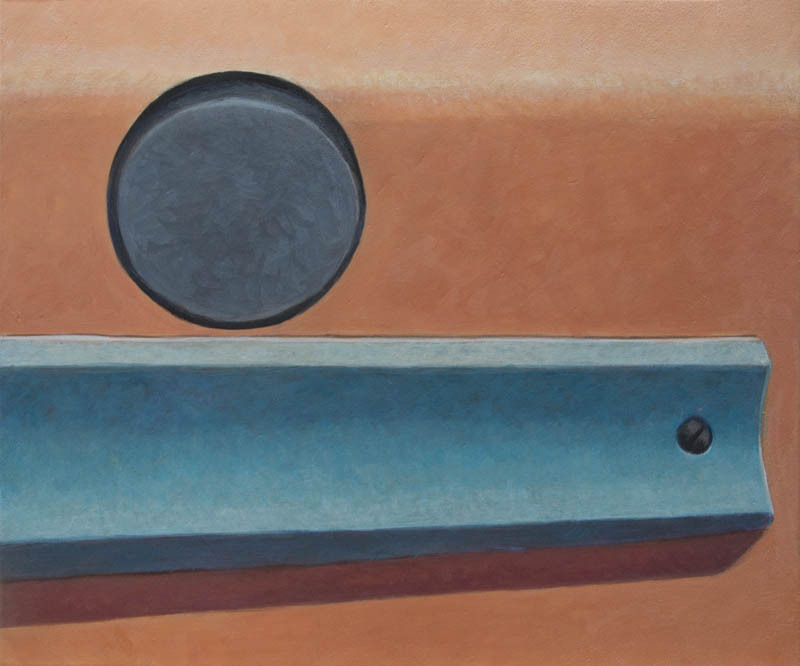 Blue Bar was one of these problem pictures: I really liked the composition, with the three circles, one large two small, and the big rectangular shape moving across the surface, a slightly curved shape, angled at bottom, a departure from regular geometry. But that shape was originally a red rust color, and I couldn't make it harmonious with the pinkish red of the background. Because I liked the composition, I decided to keep trying by changing the color of the bar; I thought a blue might work. At first the color was much too intense and I considered repainting the red to match, but instead I made the blue less saturated. Uncertainty comes with this process; I'm still not sure whether the painting works or not. What do you think? 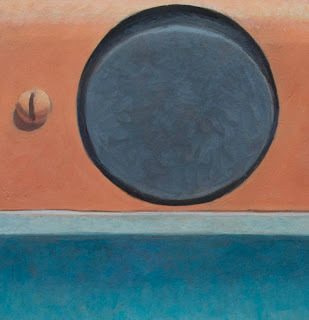 Another thing I changed was the color of the black circle, which was originally a much warmer black, with touches of burnt sienna. I cooled the color so that it would work with the blue bar. 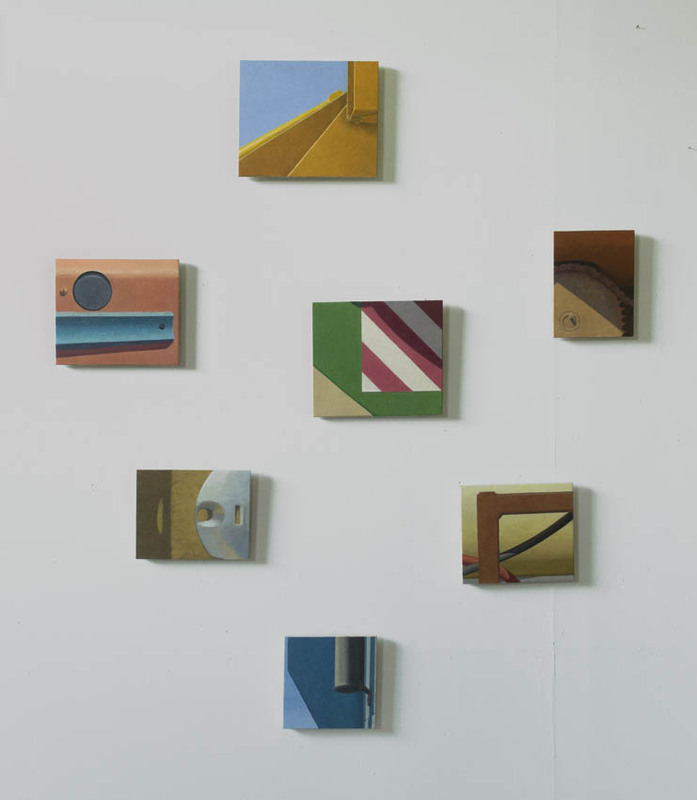 When I'm uncertain about a painting, I like to look at it in the studio, alongside other works. Blue Bar seems comfortable in this company (I think). 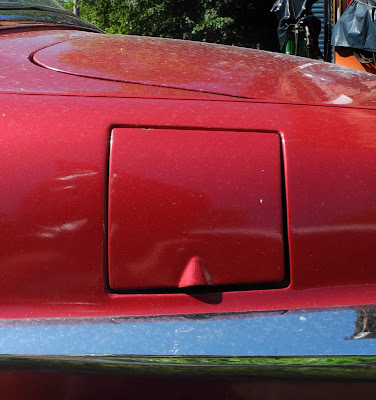 This is the first time I've done this on the blog, but here goes: here's an image below without the screw on the left which was suggested by a commenter on facebook. And I think I like it better this way, (except that without that left screw, the black circle really should move over a little to the left). The painting becomes more simple and assertive. I'll think about it for a couple of days and maybe change it, much more difficult in paint than in photoshop. 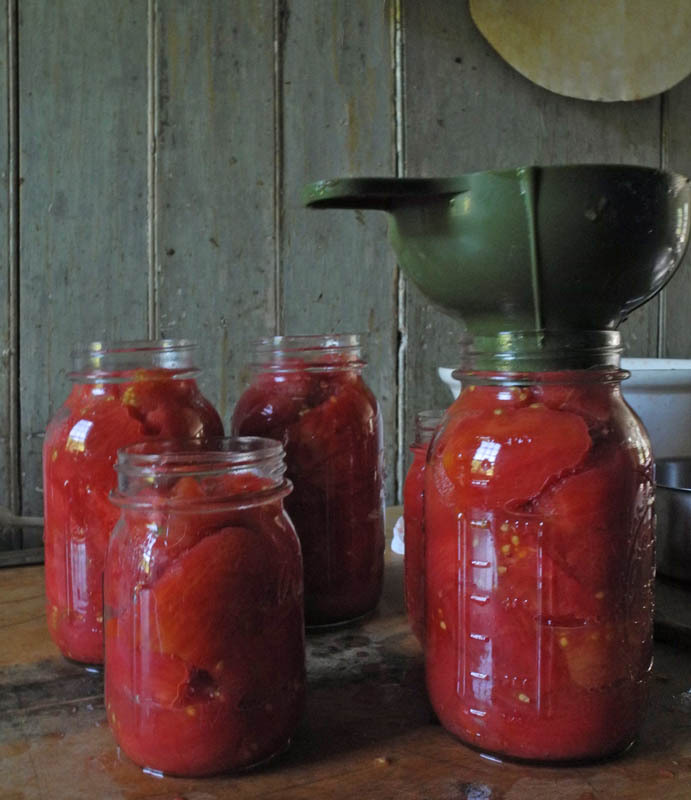 Tomato season is kicking into high gear here in northern Vermont, which means making sauce for the freezer, and canning. 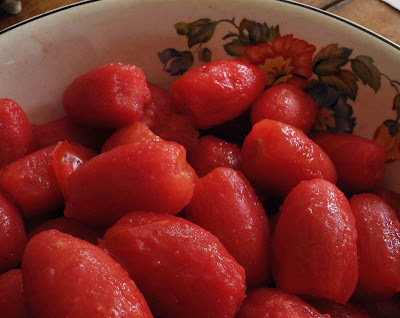 There are some recipes for which I prefer canned tomatoes rather than sauce, so I go through the extra trouble, and trouble it is, to can some if I have enough. This year is shaping up to be a very good tomato year after two or three duds, so I'm hoping to have a nice supply of canned tomatoes stored in the cellar. I'm growing a small sized, but very prolific, indeterminate plum tomato called Juliet; I mainly use plum tomatoes for processing, but add other tomatoes as they ripen and are too abundant to eat fresh. 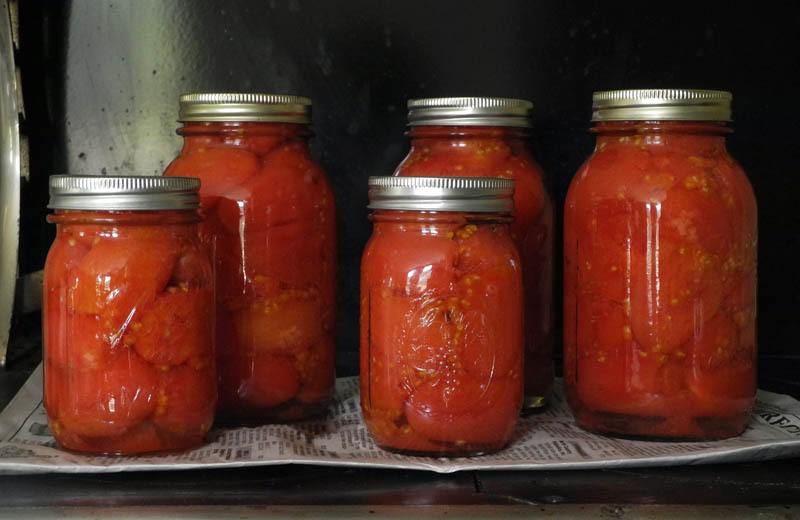 The first step in either making sauce or canning is to peel the tomatoes. The skins simply slip off when the tomatoes are placed in boiling water for a minute and then dropped into cold water. It takes time but is worth it; I don't care for the peels on processed fruits. When all the tomatoes are peeled, I squeeze them into clean canning jars, using a wooden spoon to squash them down. 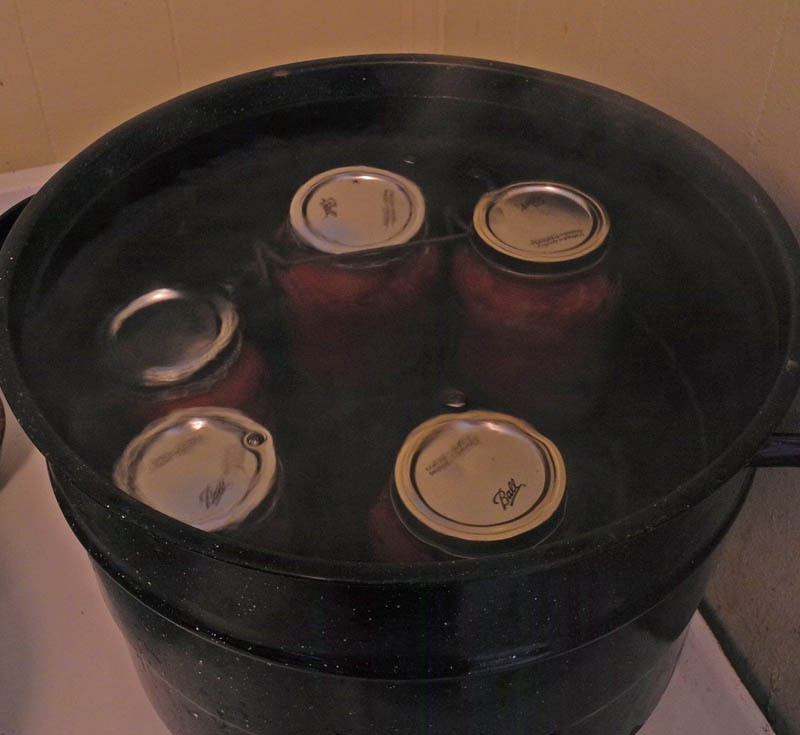 When I first began canning, I just plopped the tomatoes in the jars, which led to a jar with a few tomatoes floating on top of a lot of liquid. I wipe the tops of the jars, making sure they're clean, then place the canning lids, which have been boiled, on top. Then I screw on the clean bands. I then carefully place the jars into a canner, using a jar lifter. The canner will hold up to 7 quarts, but this time I processed only 3 quarts and 2 pints (I like to have some smaller jars of tomatoes). It is much more efficient to use all 7 spaces, but I didn't know how many tomatoes I had. 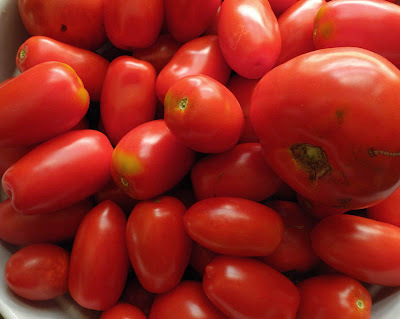 Now I know that when I fill up my big white ceramic bowl with tomatoes, it will be 4 quarts; I'll need another medium bowl full for 6 quarts (5 quarts and 2 pints). Here are my jewels, fresh out of the canner, where they have to cook at a rolling boil for 45 minutes. As they cool I'll hear the satisfying pop! pop! of the lids sealing tight. When they're cool, I remove the bands and wash the jars well, then store them in cardboard boxes in the cellar, to keep them out of the light. Seeing my freezer and cellar fill up with my home grown vegetables makes me tremendously happy. I am a very lucky artist. 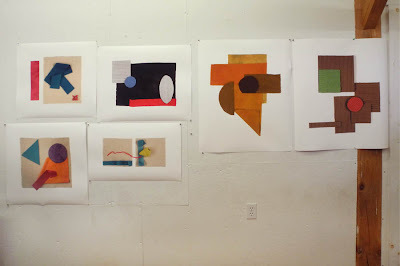 I was invited to "play" for two days at the amazing digital printshop, Cone Editions Press, by my friends Jon and Cathy Cone. We planned on Monday and Tuesday, so I spent time over the weekend getting materials together. 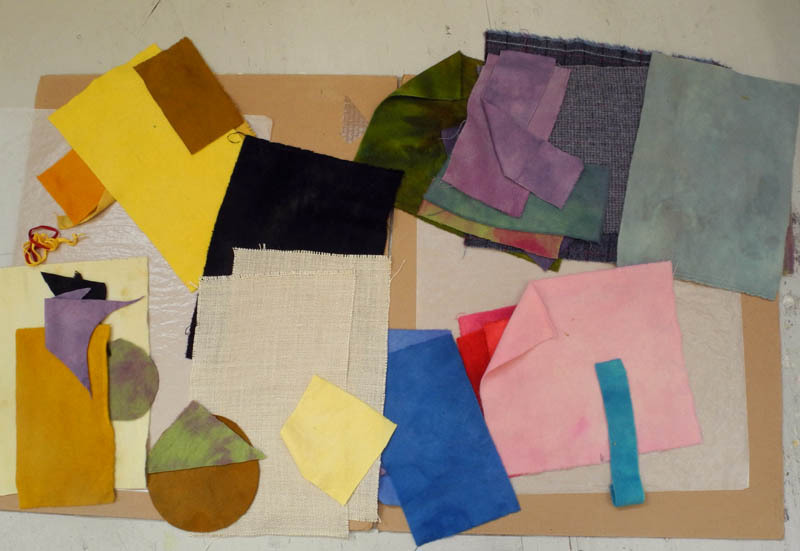 My idea was to make relief collages from my textile and cardboard print materials. I cut some linen into different sized rectangles, cut a few shapes out of wool, and ironed many leftover pieces of wool of many colors; I also cut shapes out of two ply cardboard, so as to use the corrugations in my compositions. My thinking has certainly changed over the years: my first print project with Cone Editions, many years ago, was a landscape that I drew in Photoshop. 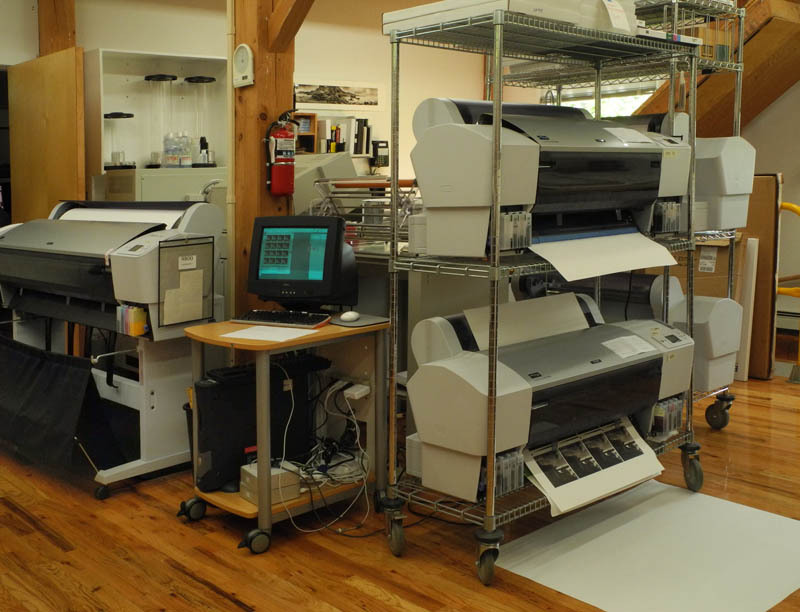 This is a view into the print room, with Epson printers stacked high. 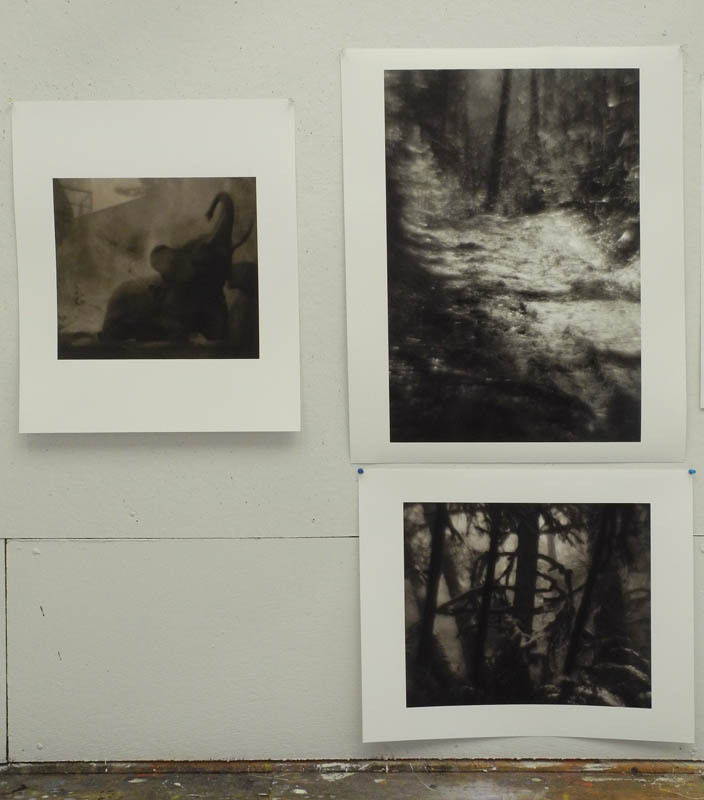 My prints were made on the printer at the left, an Epson Stylus Pro 9800. 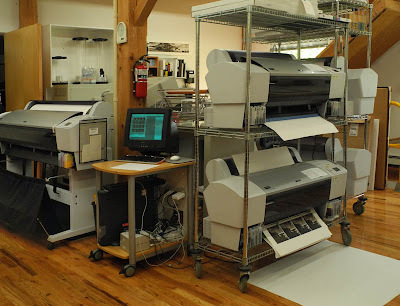 There are other printers in the shop, even an Iris printer. 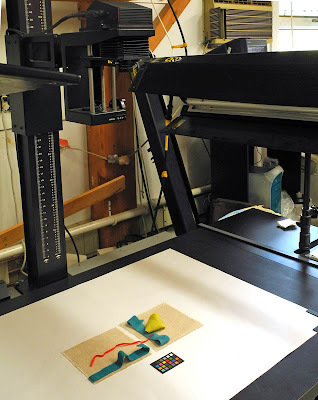 You might have wondered how I could make collages into a digital print, and here in the answer: a remarkable direct scanner that can capture objects up to 14 inches deep and 40 x 60 inches wide! in very high resolution. When I got to the shop on Monday morning, I laid out my materials and just started putting things together; I worked on a table, on the floor, and directly on the scanner bed, trying this and that until I got an image I liked. 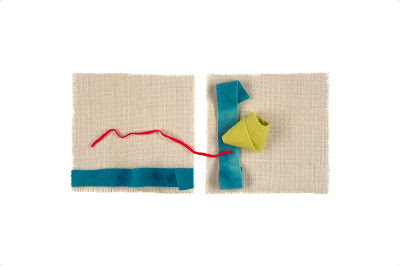 For this first piece I made a diptych of two small pieces of linen, then added the curved thick lines of blue. I wanted to include the lime green wool, so, mindful of the quality of volume and of shadow I could get (there are banks of lights at either side of the table that can be adjusted), I folded the wool into a curved form. 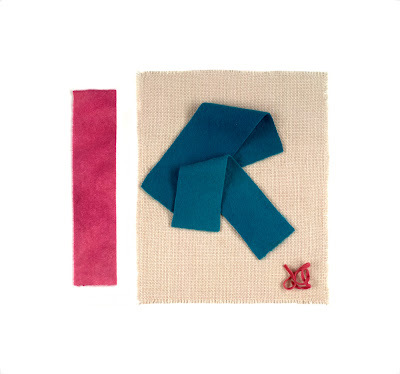 I peered over the composition, and then had the idea to tie the two parts together with a thin line of red wool. Then the scanning could begin, after focusing, which was a job in itself. The scan took several minutes. After each work was scanned, the huge digital file was sent downstairs to Jon's computer where he would do the cleaning up, and any color adjustments needed. After all the scans were done during Monday, I sat next to him on Tuesday, conferring on the many decisions needing to be made, such as which shadows remained and which would have to go. 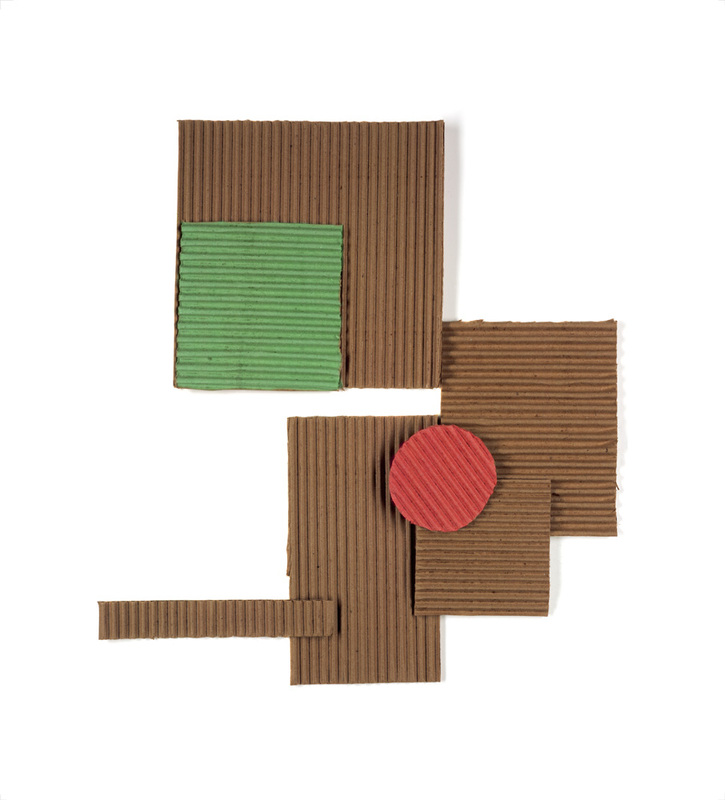 My idea in using cardboard was to color the shapes in the computer, while keeping the corrugations as texture in the image. Jon was able, with his tremendous expertise, to get just the effect I wanted; you can see the result of this image below, the print titled Ghost. Red Line, archival ink jet print, ca. 16 x 25 in. Pink Bar, archival ink jet print, ca. 22 x 22 in. In Pink Bar, I liked the idea of the unfolded and folded rectangles, with the squiggle of a deep pink line moving the eye back and forth, tying one end of the composition to the other. Ghost, archival ink jet print, ca. 22 x 26 in. This is the finished version of the print you see on the computer monitor above. 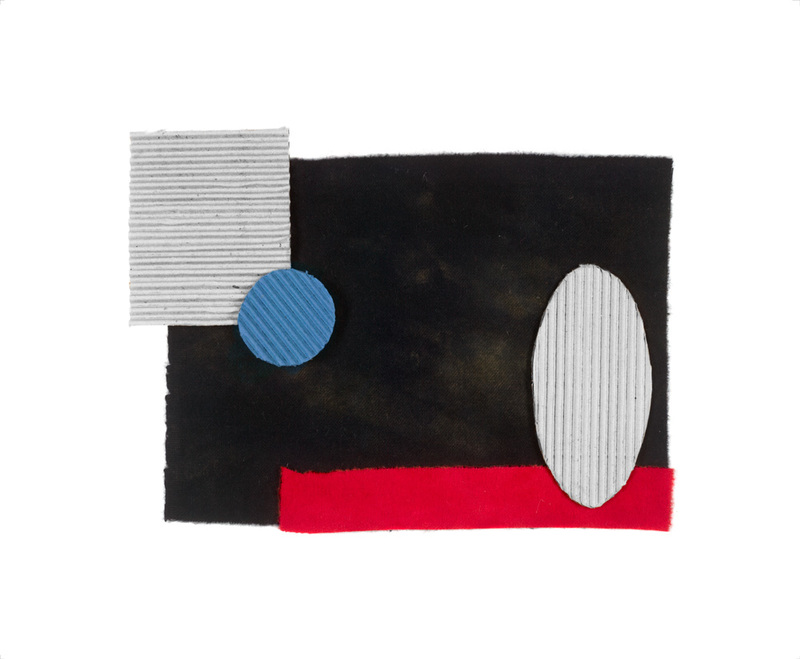 With the black and red wool background I was thinking of Russian Constructivism, so thought of making two shapes white and the small circle blue. That oval does have a figural allusion, which is why I gave it the title Ghost. Blue Triangle, archival ink jet print, ca. 23 x 23 in. This image was scanned just using the ambient light in the room (all the lighting fixtures are daylight fluorescents), and it gave particular richness to the color. 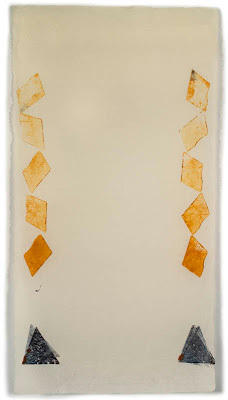 Golden Shapes, archival ink jet print, 32 x 29 in. To make my work easier, I had arranged all my wool pieces in color groups; when Cathy looked at the pile of yellows she remarked how beautiful they were and that they were Buddhist robe colors. So right then I determined to make a composition using them, with a truncated circle of cardboard at the center. 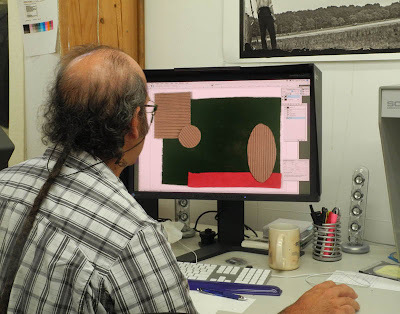 When we were working in the computer adjusting the image, at first I was thinking of a light color for that circle, but then Cathy walked in and suggested black for it. As Jon was adjusting the color, this dark brown came up and I said "stop, that's great!" and there it was; a collaborative effort. Red Dot, archival ink jet print, 32 x 29 in. 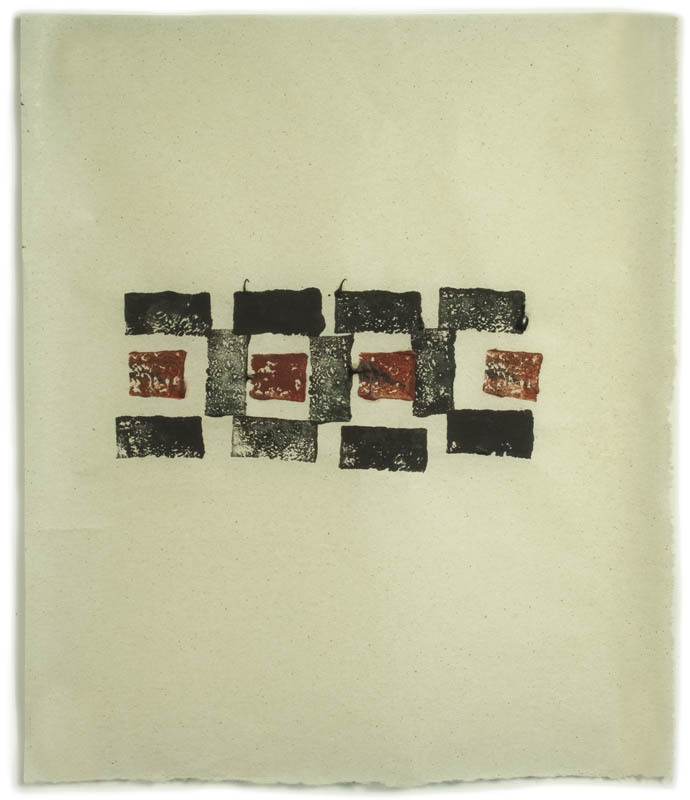 This final print is made up only of cardboard, in a rather cubistic composition. The process of arriving at this result was also collaborative, since I had a different idea of how it would end up. Originally I wanted a colored rectangle behind the cardboard, but after seeing Jon's idea of making the cardboard darker against white, which Cathy also preferred, we went for that. 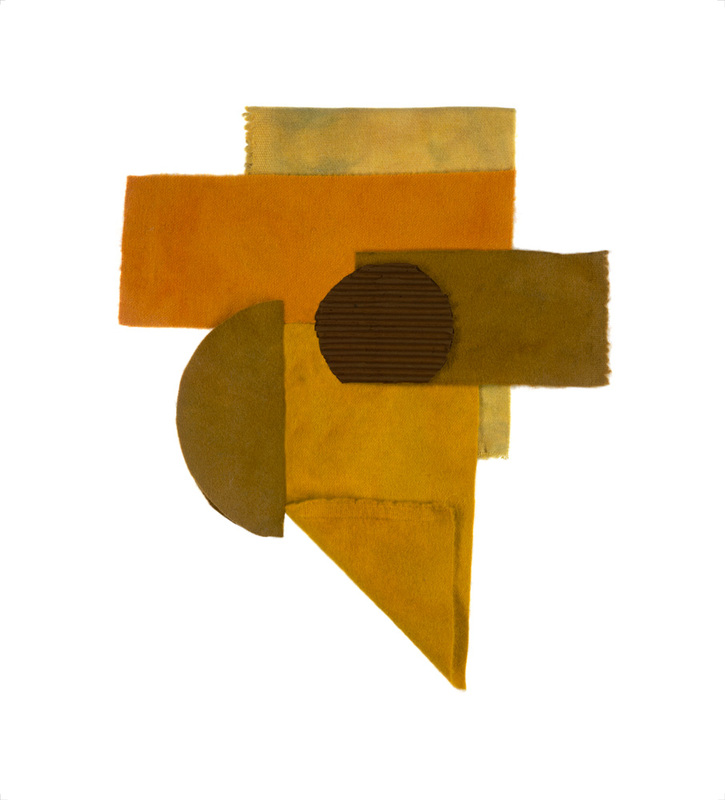 I added just two colors, to square and circle. After working for two days with these visually and technically smart people, I'd love someone in the studio all the time to bounce ideas off of; collaboration is a wonderful process. 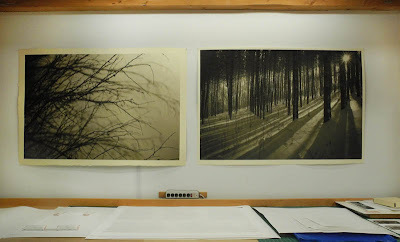 Here's a photo of the prints hanging in the studio, to give an idea of their relative sizes. Jon and Cathy don't only run a state of the art printshop, they are also terrific artists. 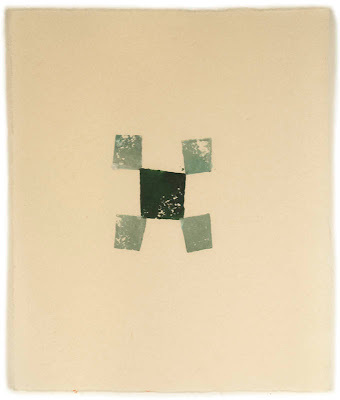 Jon has invented Piezography printmaking, using different ink sets for black and white prints of varying colorations. They have great depth and richness, and you can see it in Jon and Cathy's photographs; an online photo can't come close to showing the gorgeous quality of these images, their mystery and poetry. I am so grateful for the opportunity to have made prints with them. 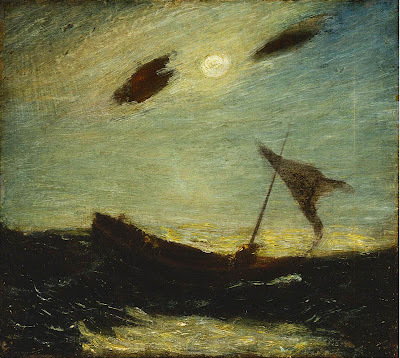 Albert Pinkham Ryder, Moonlight, 1917; oil on mahogany panel, 15 7/8 x 17 3/4 in. ....amid the tornadoed Atlantic of my being, do I myself still forever centrally disport in mute calm; and while ponderous planets of unwaning woe revolve round me, deep down and deep inland there I still bathe me in eternal mildness of joy. And meet it is, that over these sea-pastures,wide-rolling watery prairies and Potter's Fields of all four continents, the waves should rise and fall, and ebb and flow unceasingly; for here, millions of mixed shades and shadows, drowned dreams, somnambulisms, reveries; all that we call lives and souls, lie dreaming, dreaming, still; tossing like slumberers in their beds; the ever-rolling waves but made so by their restlessness. Seat thyself sultanically among the moons of Saturn, and take high abstracted man alone; and he seems a wonder, a grandeur, and a woe. 2012 #14, hand dyed wool and egg tempera on linen, 14 x 13 1/4 in. Here are two new drawings, the one below a two dimensional design, and the one above adding an illusion of three dimensional form. A couple of months ago I did a piece that departed from my usual flat shapes, adding a bit of volume (you can see it here), and I think I'll continue with that from time to time. #14 seems quite funny to me, with a stolid upright rectangle alongside the bulging one; I'll leave the metaphors to you, and they are many I'm sure. 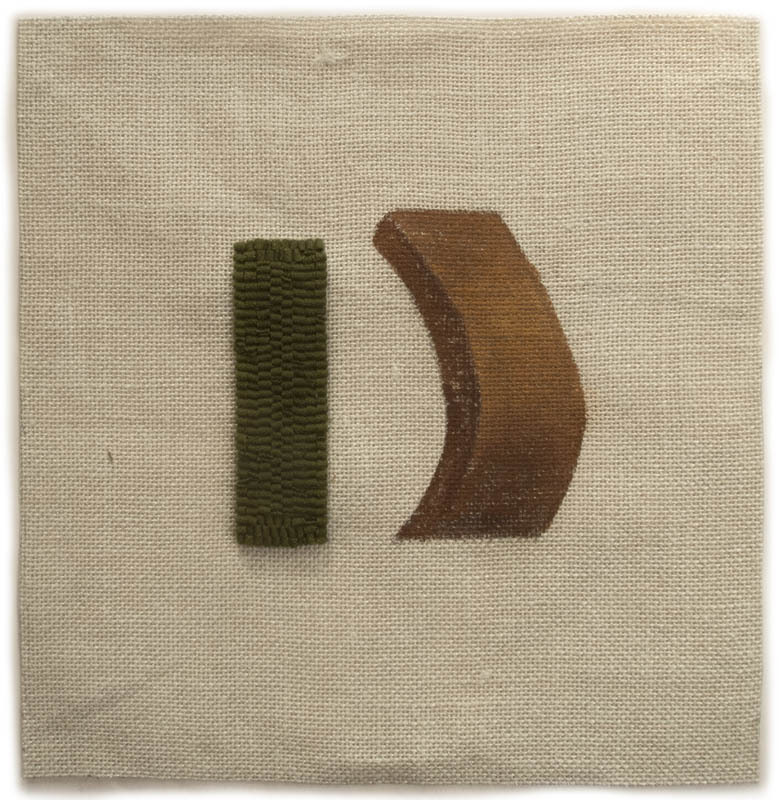 2012 #15, hand dyed wool and egg tempera on linen, 16 1/2 x 13 1/4 in. In this work, the curves of the arch have broken loose, making lines hither and thither. 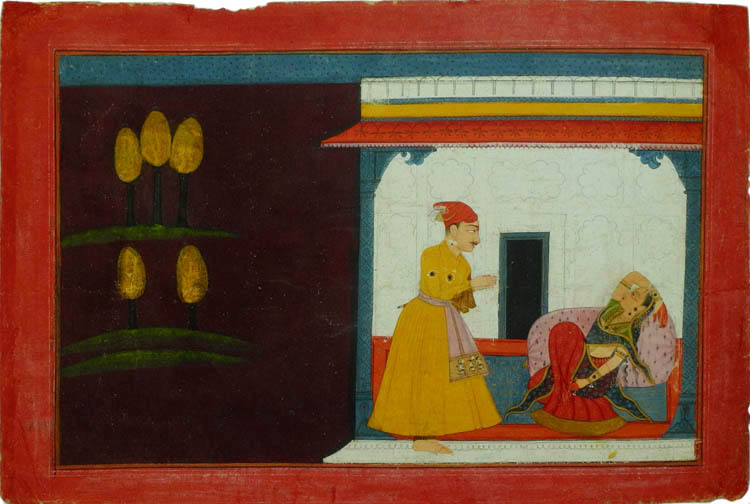 The color was inspired by the Indian miniature below. I keep a small shelf of art books in my work space, books that frequently provide ideas on color or composition. When I was doing the color sketch for #15 I pulled out my book Wonder of the Age, a catalog for a show of Indian painting at the Met, which I wrote about here. In one of my favorite paintings by Golu, there is a luscious deep purple, lit by golden trees; the reds and blues enhance the effect of that purple, a color a designer might describe as "aubergine". It's quite a journey from a narrative Indian miniature to an abstract textile, but I feel strong ties to this work and much else from the long history of art. How many of us have collections of shells, or rocks, or other interesting things we've picked up on our travels? or of salt shakers, or quilts, or teapots. This urge is partly an aesthetic one, a desire to see things we think beautiful, or strange, or interesting, gathered together in a pleasing way. It is also evidence of curiosity, of a desire to have the wide world near us, perhaps to understand it better. I began to think about this when I visited the Wadsworth Atheneum, where they had a small gallery dedicated to the "Cabinet of Curiosities", a Renaissance room full of objects of art and nature. 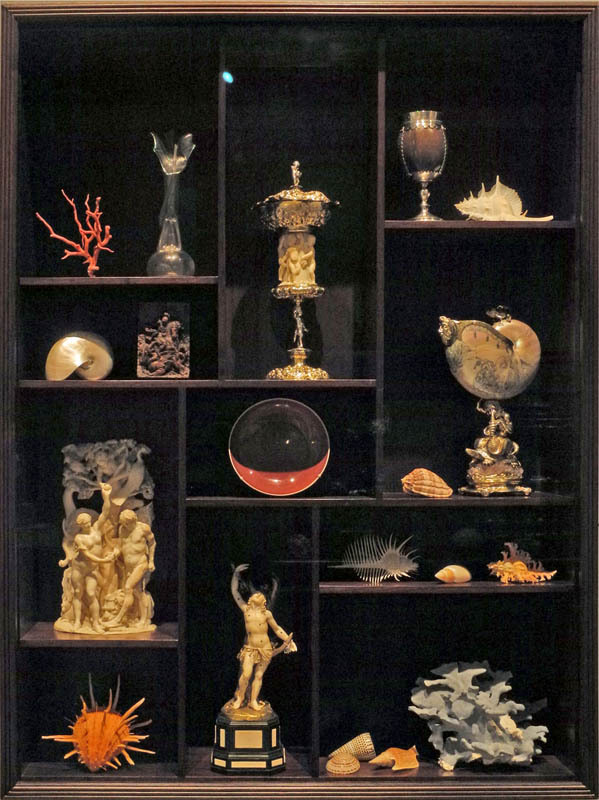 They were known in the German as Kunstkammer (art room) or Wunderkammer (wonder room), and are precursors to museums. 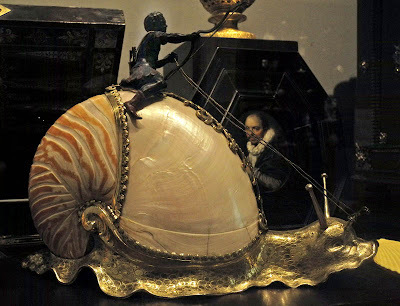 This charming piece, a snail shell fashioned into a golden steed, was one of the examples of an art/nature hybrid that might have been part of the Wunderkammer. Charles Wilson Peale, The Artist in His Museum, 1822; oil on canvas, 103 3/4 x 79 7/8 in. Cabinets of curiosities were established, as Wikipedia informs me, not only by aristocrats, but also by merchants and people involved in science. One of those here in the United States was Charles Wilson Peale, an artist also interested in natural history. 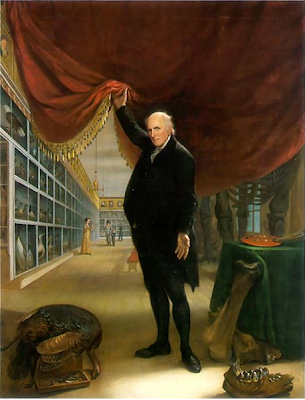 He opened a museum in Philadelphia in 1784; one of his thousands of bird specimens, a wild turkey, is at the lower left, and mastodon bones are at the right. He had worked to unearth and mount a mastodon in 1800, which we can see behind the curtain. 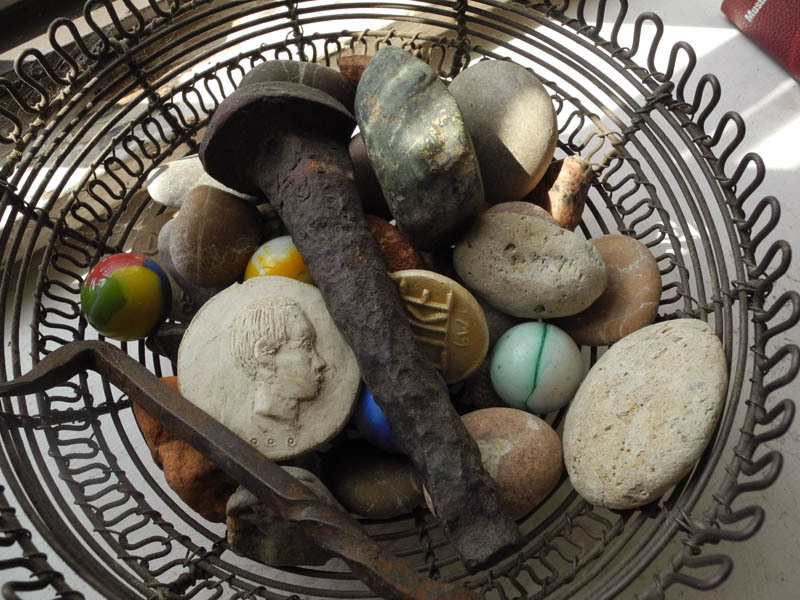 My much more modest collections are throughout my house, such as odds and ends gathered in this wire basket: rocks picked up in Australia and Europe, colorful antique marbles, a railroad spike from the Australian desert, small sculpted coins by the artist Beriah Wall. 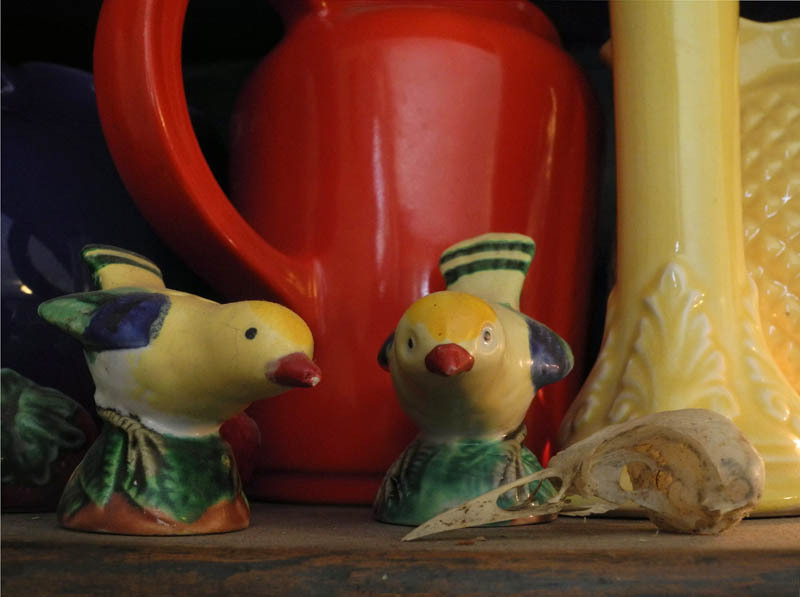 And on a shelf, a conversation between a delicate bird skull and two brightly colored ceramic salt shakers. It's good to be reminded of the world's variety of wonders as we go about our daily lives. 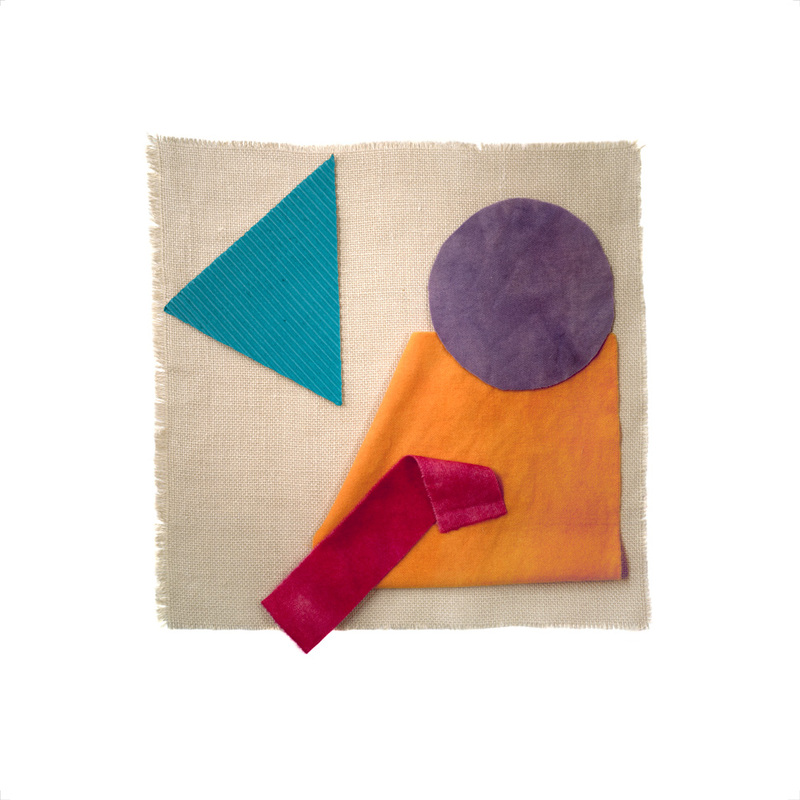 A New Textile: "Blue/Yellow Ground"